Mr Viju K. Peter is a Consultant Orthopaedic and Trauma Surgeon at the Royal Liverpool and and Broadgreen University Hospitals. 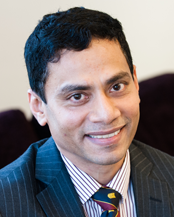 He specialises in Hip and Knee replacements, Knee and Hip arthroscopy and Revision Hip surgery. He completed his Specialist Registrar training in the Mersey Region and did further fellowship training at Wrightington and the Royal Orthopaedic Hospital at Birmingham in primary and revision hip and knee arthroplasty, before joining as a consultant in February 2008.His area of interest is hip and knee problems in adults. He has quite extensive experience in revision hip surgery and in dealing with problems related to failing metal on metal total hip replacements. He is one of the few people in the region with experience in Hip Arthroscopy and also offers CT and MR patient specific instrumentation for knee replacements. He is responsible for all research conducted by the Hip unit and his areas of interest are ceramics, high performance bearing surfaces, issues related to metal on metal hip replacements, and long term outcomes of joint replacements. He has presented and published several papers related to these both nationally and internationally. Current membership(s): Fellow of the Royal College of Surgeons of Edinburgh, British Orthopaedic Association, British Association for Surgery of the Knee, The British Hip Society, The British Medical Society and The Indian Medical Association.